Chickin and Waffles, the Pomeranians at 1-2-3-4 Go! records, have divergent tastes in music. The plot of Michael Chabon's 2012 novel Telegraph Avenue hinges on a familiar scenario: A local record store — clubhouse and confessional to a colorful crew of passionate music lovers — is threatened by the dark hand of development, textbook displacement of a neighborhood institution in the guise of urban renewal. The book is set in a North Oakland record store called Brokeland. Chabon was inspired enough by DBA Brown — a College Avenue shop that shuttered in 2005 — to include a specific homage: One of Brokeland's owners has a beagle-schnauzer mix named Jasper that dies of cancer. DBA Brown had a Jasper, too. The dog was mercilessly doted upon, visited, and coddled by folks in the neighborhood until it died in 2003. Not all store pets receive tribute in the works of famous novelists. Still, a survey of the cats and dogs stalking local record and bookshops suggested that they're universally beloved and remembered forever. "Watch yer step," a sign in the window of 1-2-3-4 Go! Records reads. "Creatures on duty." Chickin and Waffles, named for the unbeatable meal combination, are two Pomeranians with divergent tastes in music. "Chickin is a riot grrrl. 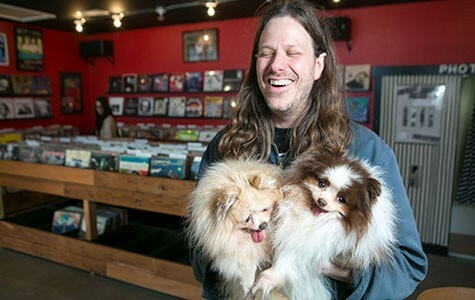 She likes [the local punk band] Quaaludes and The Coathangers," said Rob Fletcher, record store manager and owner of the dogs. "Waffles is classier," Fletcher went on. "She's all about Dusty [Springfield], Dolly [Parton], and show tunes." Aged fourteen and eleven, respectively, Chickin and Waffles both have impeccably kempt manes. Only their tongues jut out — like twiggy pieces of petrified wood. Fletcher fondly described them as "senile." He's not sure if they're good for business, because they both attract customers and distract them from the store's wares, but the pair play a vital role to the neighborhood. Employees of nearby businesses visit for pet therapy on their breaks. Fletcher brings Chickin and Waffles to work in a backpack carrying case every morning, but the two cats at Pegasus Books on Shattuck Avenue live on-site day and night. Recently, Parrit and Bean were found lounging near the magazines, presumably pondering the precarious climate of print media and silently judging customers' taste in periodicals. Parrit and Bean don't belong to a particular employee. In fact, they seem submissive to no one. Parrit and Bean have an aristocratic air — they do very little, with unfettered grace. Instead of inhabiting someone else's store, Parrit and Bean act as if they have conditionally loaned Pegasus the space. Cat doors are carved into back rooms — or rather, human doors are carved around the passageways made for Parrit and Bean. As everyone knows, dogs aren't usually so independent. "Maxine Brown was what you might call a sophisticated soul singer," explained Fernando Carpenter. "She was marketed to white audiences." Carpenter is the proprietor of Vamp, a record store in downtown Oakland focused on jazz, soul, and international music, along with vintage clothes and home furnishings. He's talking about the 1960s singer, but Maxine Brown is also the name of his eight-month-old miniature pinscher. Recently, that Maxine Brown was curled up on top of a bin of clearance LPs near a haggard tennis ball. The name, Carpenter admitted, is aspirational: Maxine Brown the dog still acts like a puppy, unapologetically seeking affection. Judging by a recent visit, in which a veritable parade of admirers stopped in to see the dog in between running errands, no one is eager for Maxine Brown to cultivate sophistication yet. Maxine Brown succeeds another small dog named after a big musician: Vamp was previously overseen by Miles Davis, who passed away late last year in his sleep, by Carpenter's side. No one could replace him, Carpenter explained, and in a way, as so many LPs in the jazz section attest, Miles Davis remains. The soul section is strong. Indeed, the stories of store animals inevitably involve sad endings and new beginnings. 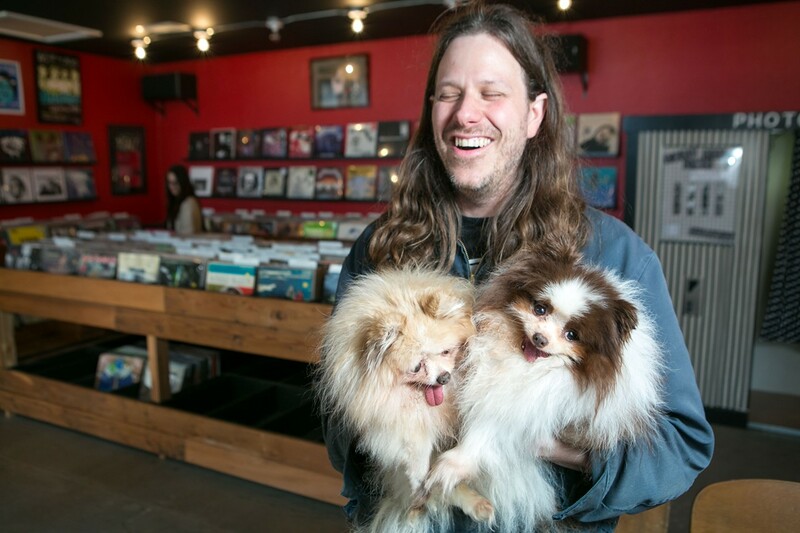 At Walden Pond Books and Records ("records" was recently reinstated into the store's identity; the growing selection of vinyl warrants it), two massive white Samoyeds named Kip and Amos rested regally on the sidewalk of Grand Avenue for more than a decade. Amos passed away in 2013 and Kip joined him last year. "They were fixtures," said employee Jeremiah Duggart. "They were featured on our website like employees." They were also impressively autonomous. Always without a leash, Kip and Amos were accustomed to trotting a block away and around a corner to relieve themselves. As a tribute posted in the store window concludes, "Kip and Amos were survived by their eight-month-old grandniece, Scout, who looks forward to someday being a bookstore dog too." So far, the training involves attracting fawning attention from passersby and reducing serious readers to infantile states of slavish canine devotion. Bookstore dogs like Scout invert the cliché: We're servile to them.